All contributions will go toward Temple supplies, Temple upkeep, Pandit’s family, and other Temple expenses. As a result, you will receive the many blessings and benefits bestowed upon a supporter of the Temple, as well as the benefits of the service you have selected. Contributing to a greater cause rather than focusing on the small self (personality desires) will bring bigger blessings. It will also bring more awareness of God within and more consciousness of the greater good. This will give a boost to each and every devotee. 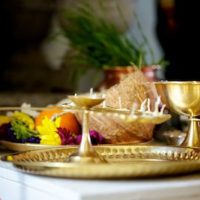 We invite you to feel the difference of a Vedic Temple and a Vedic Pandit.